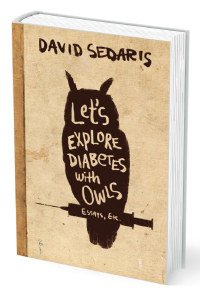 Best-selling humorist and public radio favorite, David Sedaris, recently spoke at the Penn Bookstore in Philadelphia, PA, and signed copies of his latest book, Let’s Explore Diabetes With Owls. In his new collection of essays, the self-deprecating storyteller recounts tales of his childhood, his hometown, health, partner and politics. What followed has been a steady stream of New York Times bestsellers, magazine columns and, in collaboration with his sister, actress Amy Sedaris, a half-dozen stage plays. Sedaris has won the coveted Thurber Prize for American Humor, was named 2001’s “Humorist of the Year” by Time magazine and was nominated for two Grammy Awards for spoken-word and humor albums.